SmartCompany has announced its list of Australia’s top female businesspeople for this year, which includes Australia’s richest person. The annual list is based on revenue, and is quite diverse, covering sectors such as mining and media (no prizes for guessing who), human resources, retail, food and beverages, and franchising. Topping the list is Australia’s richest person, Gina Rinehart, who, along with second placed Jan Cameron of Retail Adventures comprise the billion dollar plus club. SmartCompany suggests Rinehart could become the world’s richest person within years. 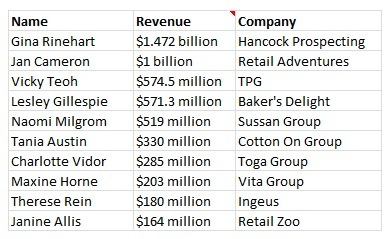 Below is the top 10 female entrepreneurs of 2012. For the full list, click through to SmartCompany.